President Muhammadu Buhari on Tuesday received the interim report of the investigative committee on arms procurement with an order for the arrest of all indicted persons in the arms scam. This information is contained in a statement issued in Abuja by the president’s Special Adviser on Media and Publicity, Femi Adesina. According to the statement, the committee which was inaugurated on Aug. 31, is yet to complete its work. But its interim report has unearthed several illicit and fraudulent financial transactions. “As part of the findings, the committee has analysed interventions from some organisations that provided funds to the Office of the National Security Adviser, Defence Headquarters, Army Headquarters, Naval Headquarters and Nigerian Air Force Headquarters, both in local and foreign currencies,’’ it said. It stated that so far the total extra budgetary interventions collated by the committee was N643.8 billion while the foreign currency component was $2.1 billion. The report indicated that the amounts excluded grants from the state governments and funds collected by the Directorate of State Services and the Police. The statement said the committee observed that in spite of this huge financial intervention, very little was expended to support defence procurement. According to the statement, the committee also noted that the amount of foreign currency spent on failed contracts was more than double the one billion dollars loan that the National Assembly approved for borrowing to fight the insurgency in the North East. It stated that the committee also discovered that payments to the tune of N3.850 billion were made to a single company by the former NSA without documented evidence of contractual agreements or fulfillment of tax obligations to the Federal Government. 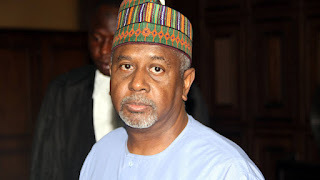 “Further findings revealed that between March 2012 and March 2015, the erstwhile NSA, Lt. Col. Sambo Dasuki (rtd) awarded fictitious and phantom contracts to the tune of N2,219,188,609.50; 1,671,742,613.58 dollars and 9,905,477.00 euros. “The contracts, which were said to be for the purchase of four Alpha Jets, 12 helicopters, bombs and ammunition were not executed and the equipment were never supplied to the Nigerian Air Force, neither are they in its inventory. “Even more disturbing was the discovery that out of these figures, two companies, were awarded contracts to the tune of N350,000,000.00; 1,661,670,469.71 dollars and 9,905,477.00 euros alone. “This was without prejudice to the consistent non-performance of the companies in the previous contracts awarded. “Additionally, it was discovered that the former NSA directed the Central Bank of Nigeria to transfer the sum of 132,050,486.97 dollars and 9,905,473.55 euros to the accounts of Societe D’equipmente Internationaux in West Africa, United Kingdom and United States of America for un-ascertained purposes, without any contract documents to explain the transactions,’’ the statement said. The statement noted that the findings made so far “are extremely worrying’’ considering that the interventions were granted within the same period that the nation’s troops fighting the insurgency in the North East were in desperate need of platforms, military equipment and ammunition. “Had the funds siphoned to these non-performing companies been properly used for the purpose they were meant for, thousands of needless Nigerian deaths would have been avoided. “Furthermore, the ridicule Nigeria has faced in the international community would have been avoided,” the statement said. The committee noted with disappointment that those entrusted with the security of this great nation were busy using proxies to siphon the national treasury, while innocent lives were being wasted daily. “In the light of these findings, President Muhammadu Buhari has directed the relevant organisations to arrest and bring to book, all individuals who have been found complicit in these illegal and fraudulent acts,’’ the statement concluded.